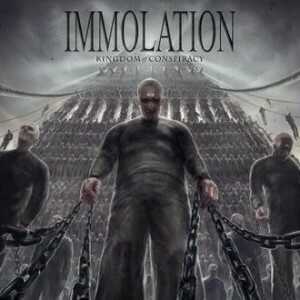 NY death metal legends Immolation have posted the lyric video for “Kingdom of Conspiracy,” the self-titled track from their ninth studio album. Kingdom of Conspiracy, the follow-up to 2010’s Majesty and Decay, will be released in North America on May 14 via Nuclear Blast. The album was recorded in Millbrook, NY by producer Paul Orofino and mixed and mastered by Zach Ohren who has handled the duties for Immolation in the past, along with work for Decrepit Birth and Suffocation. Immolation release new single from upcoming album called "Indoctrinate"